In the last several days, numerous articles have been published discussing the possibility of retired Marine Corps General James Mattis running for president. The General has dismissed the notion several times. But could he be convinced to answer the call? The electorate seems to be looking for somewhere else to go with their vote. Many voters on the right and the left feel they are being forced to vote for someone they're not excited about. 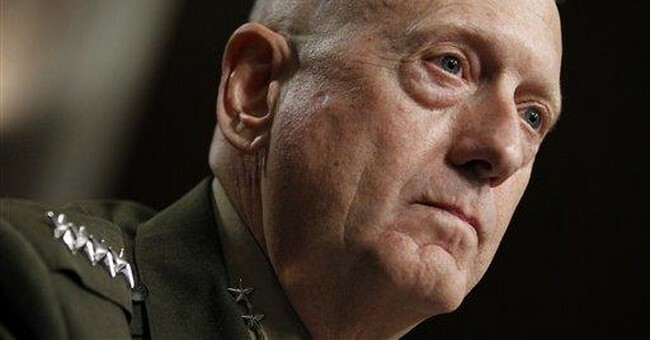 As a veteran Marine myself, I fully support the idea of General Mattis becoming president. I also think it's high time this long running half-joke within the Marine Corps became a serious electoral proposition. Several outlets, including The Daily Beast and our own HotAir, have laid out several scenarios that could lead to a Mattis administration. If the Republican Party ends up in a battle royale at the convention, why not nominate a seasoned and respected veteran for president? There are some hard realities on the road to President Mattis, however. The only conceivable means to a Mattis presidency would be through a contested GOP convention in which delegates come to a stalemate over existing candidates. Right now, the proposition is a long shot. As noted by Alexander McCoy writing for Task & Purpose, third-party run is virtually impossible given how little time remains before ballot qualification deadlines. But the question that has to be answered first and foremost is this: can Mattis demonstrate enough popular support to be viewed as a serious contender for the nomination at the convention? I started a change.org petition to float the idea to the world. I, for one, don't intend to be a associated with war crimes, carpet bombings, socialism or violations of federal law, so I'll throw my support behind a man who knows a thing or two about defending America.